I have not posted anything on this website for a while due to RL working frenzy. It is nice to make a come back to write about my visit to VIBE (Virtual Islands for Biology Education) regions in Open Sims. Third, I opened imprudence viewer and clicked the grid manager (middle bottom) to add vibe as grid name and to type this http://vibe.bio-se.info:9000 in the URI column. Fourth, I clicked the grid info, pressed ok then that was it. I was ready to login. It was really exhilarating to be able to visit VIBE, especially because I tried hypergriding for the first time. (Right...Don't laugh at me!) It was just as easy as teleporting in Second Life. We visited the Genome Island (One of my favorite places is SL that is set up here too), the Mayan pyramid, the underwater habitat, the mega sandbox, and the freebie shop. I am sure there were many more available there but we had no time to explore all. Here's my thought from that very short visit. If developing Open Sims is as affordable as developing websites, I can imagine that in near future students and educators can easily access interactive 3D virtual world as easy as accessing interactive websites to improve learning. How cool is that? This is what I have been doing for quite some time. I let my students write their science fiction story books every semester. No, it is not part of the curriculum. But I have seen how my students love doing it and are good at fabricating stories based on some Science principles that they have learned or try to understand. As usual, before using a sim for my class, I would explore the place thoroughly. It helps me design a lesson plan better. I teleported to Jules Verne Museum this evening and was instantly disappointed. It was indeed not love at the first sight. Nevertheless, I took a ride on a boat which was available there because I saw a submarine at a distance. I assumed it was Captain Nemo's submarine in "20.000 Leagues under the Sea" although it looked too modern to be one. Before I reached the submarine I jump off the boat into a capsule which was floating in the sea. I sat on the chair inside the capsule and pressed the button. OMG, I sank. When the elevator stopped, I stepped out and saw a magical underwater wonder. Wow! There were domes and tunnels. Could it be the undersea mines as described in Jules Verne's book "20.000 Leagues under the Sea"? It took me more than 1 hour to explore the underground platform. I reached a chamber where I could get a diving apparatus, it was exactly the same as the drawing of the apparatus on Jules Verne's book. Later I found out that Veritas Rainmaker, my friend, aka Dr Lim Yang Teck Kenneth, a research scientist from National Institute of Education Singapore, created the museum. It was unbelievable. I should give him credits for this amazing work. I don't have to mention about how beautiful the underwater museum is. You can explore it yourself. I moved to the other exhibit in the museum. It was taken from Jules Verne's other book "A Journey to the Center of the Earth." There was a volcano underwater. It was probably the volcanic tube Jules Verne wrote in his book. What a fantasy. Too bad there was no Runic cryptogram there and the interior of the earth was not exhibited there...Yeah yeah....I was being very demanding. I still had one more exhibit to explore but I was too tired. Although the museum was virtual, exploring such a big place took almost as much time as visiting a real museum. I learned many great lessons from this journey. One of them is "Don't judge a sim by its surface." I attended this conference in October last year because I was interested in one of the keynote speakers' presentation about Jibe (Pathfinder) and because I was amazed by how Finland, a country that has consistently come at the top for the international rankings for education systems, was active in Second Life. Last night I stumbled across this machinima when I was looking for German sims in Second Life. I feel in love with Bayerische Stattsbibliothek - The Bavarian State Library instantly. The machinima was 4 years old so I was not sure Bayerische Staatsbibliothek still existed in Second Life. I tried to search the slurl (the address of a certain location inside virtual world Second Life) of the library and .... BINGO! I found it. I was amazed that the Bavarian State Library used their virtual representation actively. Here's the library official website with a page about their virtual representation: http://www.bsb-muenchen.de/Virtuelle-Services-in-Second-Life.2264.0.html . I landed in front of a huge teleport map in front of the virtual Bayerische Staatsbibliothek. The teleport map is especially useful for visitors who are not familiar with the physical library. They can explore the virtual building before the visit the library. 9 major parts of the library represented in virtual world are more than enough to give first time library user a sense of direction. Those parts are Friedrich von Gärtner saal, Ausstellung, Marmorsaal, Lesesaal, Treppenhaus, Fürstensaal (my favorite room), info center, innenhof 1, and innenhof 2. I was astonished by the reproduction of the library in Second Life which was almost true to the original. (Except the real building is much more luxurious than the one in SL - See the slideshow) Nevertheless, the virtual library can still serve the purpose that is initiated by the library, which is to provide a place for the library users to interact, communicate, learn, play, and trade knowledge virtually. I learned that due to copyright issue, Bayerische Staatsbibliothek could not lend their books to users in virtual world. So what is a library without books, right? I am not a fan of copyright. (My publisher friends will give me a mean look when they read this) In the future when copyright is no longer an issue, a virtual library can function like a real library. Technically it is possible to publish, lend, borrow, and read books in virtual world. For the mean time, I was satisfied with the non copyrighted books, such as historic books which were available at virtual Bayerische Staatsbibliothek. The library brought their historic books collection to virtual world and converted them into 3D book. Some books dated back in the year 1200s. What a treasure! I got more excited about the idea of virtual publishing after my virtual visit to this 450 years old library in Munchen. Perhaps, I should contact the librarian and ask him if I my students can display their virtual books there. That will be something. John Man started his journey from Xian, the place where the terracotta army was found and I started my journey right in front of a dark cave with a narrow opening in SL. There was a huge mound near the cave that I assumed was the Qin emperor's tomb. The cave tunnel was dark and creepy. At the end of the tunnel, there were three pits with terracotta armies in them. I read the book and it was said that initially there were four pits in the location but one pit was not filled by the time the construction ceased. 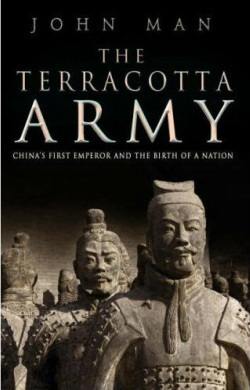 According to the book, there were more than 8000 terracotta warriors uncovered from the ground. I was sure the number of warriors at the burial site in SL was not that many. I could find many horses in the pits but no chariots as described in the book. One might ask this about this virtual replica of the terracotta army: How can we even learn if the replica of real historic place in virtual world is not accurate? Funny enough, I learned a lot from the inaccuracy of terracotta army in SL. It motivated me to read John Man's book to find the claws in the replica. I kept the book for a while because I found description after description in the book confusing. With no pictures at all in the book, except maps, I couldn't relate myself to the first emperor of China through what he had left behind. Honestly, because the replica of the terracotta army I visited in SL was not very accurate, I didn't feel like I visited just another tourism spot in China with crowds everywhere. The solemnness of the terracotta army burial site in SL helped me imagine the towering personalities of the first emperor of China, Qin Shi Huang, who combined leadership, vision and, RUTHLESSNESS. Hey, did I tell you that I could walk through the pits and be among the earthen warriors? I must say you will not come this close to the warriors even if you can afford to go to Xian, unless you are Queen Elizabeth II of course. And you cannot possibly keep a set of terracotta army for your class in real life but in virtual world, you can have the virtual version of them for just 1700 L$ (7 US$ / 65.000 rupiah) Happy exploring! I got this tour invitation last night before midnight via a Facebook Group. I thought I would take a look at it before heading to bed. The tour guides were Katherine Watson Prawl, a person behind ISM (International Spaceflight Museum) and Jeffry Corbin, my friend from Physics and Astronomy Department University of Denver, the co-founder of Sciland. When I logged in SL, the tour had already been started. I was late. I didn't know what I had missed. Jeffry teleported me to a dome with beautiful view of the universe. Many other tour participants were there too. I almost got vertigo being in that room. Luckily, soon after I was there, we had to move to the next destination, the gift shop. I have been to ISM gift shop before, so I was quite familiar with the place. I spotted that there were more products for sale than before. I was particularly interested in the telescopes. They were quite expensive (L$ 1200 / Rp 45.000) but I needed to have a good telescope to teach my students inworld so I bought one, a Newtonian reflector telescope. After visiting the gift shop, we went to ISM conference hall to listen to Katherine's presentation. There was a technical problem before the presentation so I decided to take a look at International Space Station (ISS) exhibit. I was so surprised the ISS was fully developed. Last time I went there with my students, it was still under construction. I was sure my students would love the fully developed ISS. The technical problem was finally solved and we all listened to Katherine's presentation about exhibits in International Spaceflight Museum. There were more exhibits in ISM than I thought. I couldn't believe I didn't know about the interactive space shuttle and the Mars exhibit there. I realized that I knew almost nothing about the ISM although I thought I was familiar with it. I learned more about it last night, thanks to Katherine and Jeffry. The tour was fun. (especially because I could do it while on bed) I am sure the knowledge I got from the tour would enrich my teaching in SL. I was watching America's Next Top Model when I had a thought about Venice. (Yes, I am a fashion conscious science teacher who wears high heels in labs) The models in the show were dressing up in the 18th century Venice costumes. I was stunned during the show, not by the models' pose to attract a Roman god-like male model who played Giacomo Casanova but by my own disbelief of how little I knew about Venice. Not far from Ponte di Rialto, in a goldola stop, I met an Italian man in gondolier outfit. (gondolier is gondola operator) who welcomed me in his strong Italian accent. It was unbelievable that there was such thing as virtual goldolier. He offered me a tour around Venice on his gondola. I gladly accepted the offer and gave him 100 L$ tip. He shared stories about Gondola and Venice as we moved along the canals. His knowledge about long ago and present day Venice was extensive. It was only comparable to an experienced tour guide or even a historian. I learned that it was not easy for the gondolier to be able to steer the virtual gondola while continuously sharing stories and answering questions from the passangers. I was sure without proper trainings, anyone would not be able to become an excellent tour guide like the gondolier, even virtually. It was an amazing virtual tour of Venice. Only love could build such beautiful city. The realistic replica of this Marco Polo city in Second Life enabled me to feel that I was really there exploring the canals, the historic buildings such as Piazza San Marco, the arts, the shops, even the people. I wasn't surprised when the gondolier told me that virtual Venice had been used several times by some colleges to teach tourism. What a great way to teach tourism in one of the most famous tour destinations in the world.....if you cannot do it in physical world, at least you can do it in virtual world. My first encounter with virtual reality room was in Natural History Museum of Vienna. Unlike most replicas which were built out of prims, Natural History Museum of Vienna was built out of series of images that were designed and placed in a certain way to create an immersive environment. I haven't visited other places with such photo-realistic environment ever since. Last week, my friend Zazen Manbi (Jeffry Corbin - Research associate in Physics and Astronomy at University of Denver) teleported me to a skybox in Sciland. The exterior of the skybox was dull but the interior was breathtaking. The skybox was a holodeck, a virtual reality room. With just a click, I could change the environment of this holodeck into a night city life, jungle, museum, mine, cave, coral reef, royal palace, historic building, and many more. Holodeck is a room full of realistic pictures but different from just looking at pictures of a place, we can explore, be immersed, and have 360 degrees vision in it. It was a great environment to teach and learn. Imagine the difference between learning about cave in a traditional physical classroom and in a cave environment. I know my students will choose to learn in a virtual cave than having no cave at all in our classroom. The virtual reality environments in a holodeck create a motivating atmosphere and a visual stimulation (which are good for learning) on a dime. We don't need to spend a fortune or be in Star Trek: The Next Generation movie (where the term and concept of holodeck were coined) to be able to enjoy learning and teaching in a holodeck. Holodecks are available for sale in Marketplace. There are some freebies too. My friend Aedann Slade, (the headmaster of North Carolina Web-Based Immersive Environment for Education ) gave me some virtual reality holodecks yesterday. I was not able to set them yet but I am determined to learn more about it. "To teach is to learn"
I tried to read a few chapters of "A History of Fashion and Costume" book a couple of days ago. Fashion is actually not my particular interest but I believe that we can't completely understand human history without learning about fashion. So I chose to read a chapter about French female fashion, especially during the reign of Louis XIV, Louis XV, and Louis XVI. I remembered that there was a replica of Chateau de Versailles in Second Life. I was sure I could enrich my learning about French fashion by going there. I have strong reasons for it. Louis XIV was the person behind the expansion of Chateau de Versailles after it was built as a simple hunting lodge by Louis XIII in 1624. Louis XIV - XVI had lived in Chateau de Versailles. So I thought that the fashion should not revolve far from the chateau. I was right. As soon as I teleported to Chateau de Versailles, I found a small marketplace outside the chateau. There were carts of mostly female period outfits for sale. I saw the replicas of Madame de Pomadour's and Marie Antoinette's gowns. They were among the most expensive items there. I spent hours just to read notecard from each cloth. I learned a lot about Baroque and Rococo style from the notecard. I was lucky to meet one of the cloth designers who happened to be a certified Versailles designer in SL (lol) and a historic fashion designer in RL. She told me about the differences between Baroque style outfits which were dominant during the reign of Louis XIV and Rococo style outfits which flourished during the reign of Louis XV and the beginning of that of Louis XVI. I bought four outfits before I entered the chateau, (1 Baroque, 2 Rococos and 1 transitional outfit between Barouge and Rococo style). Usually I am very frugal but I wanted to be immersed in what I was learning at the time. My most expensive outfit was a blue flowery Rococo style mantua. The bell shaped skirt, florid fabric, playful color and fanciful style were distinctive characteristics of Rococo. It was a really fun learning. Although I was not fond of the powdered wig, a total of 800 L$ was worth spending. That much money could only buy me a cup of Starbuck here, NOT a ticket to France or a royal experience, like dressing up in Chateau de Versailles. Being immersed in the 16th-17th centuries enviroment gave me a glimpse of what women, especially the noble ones, went through just to get dressed. That makes me grateful that right now I can write this post just in shorts and T-shirt. Don't hate me for saying this but learning about art in virtual world is better and more immersive that learning it from Google Art Project (www.googleartproject.com) . Here's my experience. In my attempt to learn more about museums and art galleries in Germany, I browsed Google Art Project and entered Gemäldegalerie (simply means picture gallery) in Berlin. I was wondering if there were other German picture galleries that I could access through the web. So I searched them on Google. What a surprise, the gallery has built a replica in Second Life. I teleported to the gallery in SL instantly and landed near the pond in the middle of the building complex which, I learned later, was a Zwinger palace, the palace of Augustus the strong, elector of Saxony in 1700s. It was love at the first sight. I think it would be hard for anyone not to fall in love with the Baroque style and neoclassical buildings there. The Old Masters Picture Gallery was located in a building called Semper Wing, the fourth wing added to the three-winged Zwinger palace. It took me a while to find the Semper Wing. (Hey..it was really a huge complex) As soon as I stepped into Semper Wing, I was stunned by the beauty of Neo-Renaisance interior. It might sound strange to you that one could shiver physically just being in something virtual but I did. I didn't know where to start. I read that the gallery had 750 masterpieces from European art history and some of them were among the most famous and supreme paintings like Raphael´s "Sistine Madonna" or Giorgione´s "Sleeping Venus". I decided to go for the most talked about first. As I explored the green rooms and pink rooms in search of those paintings, I stumbled across hundreds of other masterpieces including my favourite painting by Johannes Vameer "Girl Reading a Letter" . I clicked the paintings to get notecards of information. Some paintings had audio guide I could listen to. The paintings themselves were supreme. Combined with the ability to explore them in 3 dimentional virtual gallery WITH other people made them almost divine. This was something that I couldn't do in Google Art Project. I still have lots to learn there. My next learning target is "Das Schokoladen Mädchen" or "The Chocolate Girl" by Liotard. There was a chocolate girl costume sold in the gift shop near the gallery entrance. It would be great to dress up as we learn, wouldn't it? (Ugh.....but the costume costs L$450) . I hope to join other activities in virtual Dresden Gallery in the near future. Would you come with me? - Taking educator development classes of various subjects, from Biology to Literature. - Taking building, scripting and machinima classes. - Currently learning to bring Indonesian endangered plant species to life in SL.